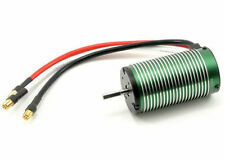 This ZTW 1/8 scale 2350 KV motor is a competition grade motor. This is a NEW Genuine SKY RC SK-400010-05 TORO X8P 1650KV Sensorless Brushless Motor: 1/8 Buggy. This is SKYRC TORO X8P 1650KV Sensorless Brushless Motor for 1/8 Buggy. SKYRC TORO X8P 1650KV Sensorless Brushless Motor (1 set). It all starts in our very own factory where we install precision bearings, correctly rated magnets, balanced rotors, tool-steel shafts and stators that are wound by hand. We rigorously test each and every component at 14 critical points during construction, testing everything from materials all the way through to final performance tests. 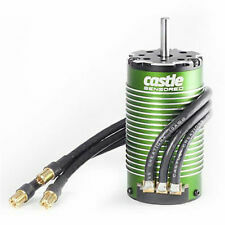 This is the Neu-Castle 1515 1Y, 2200kV 1/8 Brushless Motor. Pushing your Mamba Monster to the max?. Just the type who likes the motor as cool as possible?. No matter which category you fall under, Castle has the solution! These are nice motors, but expensive. This is a nice motor, but affordable. That's because it's missing the box and manual, and I'm a rad dude and a generous individual. This motor feels great and looks to have very little if any use on it. This is a NEW Genuine SKY RC MICRO TORO 4300KV 14T 4 Pole BRUSHLESS MOTOR : 1/18 CAR. KV value 4300KV Resistance (Ω) 0.037Ω. Turns 14T Max current 30A. Boats (Gas & Electric). Nitro & Electric Engines. These sensorless brushless motors have precision bearings, correctly rated magnets, balanced rotors, and premium grade steel shafts. • Precision-balanced rotor will boost the efficiency and power performance of the motor. Eflite E-Flite BL10 Brushless Outrunner Motor 1300kv Timber EFLM108018. Condition is Used. Shipped with USPS Parcel Select Ground. HPI 101725 FLUX 4.5T COMPETITION BRUSHLESS MOTOR VERY FAST BRAND NEW FREE SHIP..
Brushless Sensorless Motor. Motor Shaft - 5mm w/ 15mm long flat spot. Motor kV - 2200. These are just what the doctor ordered! These sensorless brushless motors are fitted with precision bearings, correctly rated magnets, balanced rotors, and premium grade steel shafts. Bolt Thread:M2.5. This is the Neu-Castle 1512 1Y, 2650kV 1/8 Brushless Motor. Bearings Oversize ABEC-1 Front/Rear. NOTE: It is OK to shorten the motor wires. Motor Specifications. Motor Length 68mm. Connector 6.5mm Gold. This is a NEW Genuine HOBBYWING XERUN XR8 SCT Pro ESC / 3652SD 4300KV G2 Motor : 1:10 / 1:8. 1x XERUN 3660SD G2 or 3652SD G2 Competition Brushless Motor. The Hobbywing XERUN SCT 3660SD G2 Sensored 4300kV Brushless Motor is a 4-pole power house, great for heavy-duty short course, truck and monster truck sensored applications. Worlds Fastest SPEC Class Sensored Brushless Motor. Sensored Design. PUNISHER 13.5t. Not available in ROAR, EFRA or any other sanctioning body version. This is a pure run what you brung class motor. B28-47-22S-FIN Brushless Inrunner 1800kv. Bolt thread:M3 2 & M2.5 2. Gold Connection:Φ3.5. Suggested ESC:35A. Flux Tork 2200kV Brushless Motor. 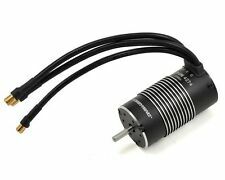 Flux Tork 2200kV Brushless Motor (Part # 100685). Input Battery LiPo: 6S Maximum (twin 3s), 22.2V. Maximum Input Volts 25.2V. HPI 1/8 Savage XL Flux (Model 112609). MORE TRUCK FOR YOUR BUCK Since 2002! Sensored:Yes (Standard 6 pin harness). Featuring a quality CNC motor can, hand-wound high purity copper windings and powerful sintered neodymium magnets, you wont find a better priced motor of this caliber anywhere else! The Leopard 4092 is a crazy long, crazy powerful motor. Can be used in anything from 1/8 vehicles, lightweight 1/5 scale rigs and large boats. Check your clearance before ordering! Leopard motors are built using the highest grade components for outstanding performance and long life. 4.5 out of 5 stars - Leopard 4092 4-Pole Brushless Inrunner Motor 1480KV For 1/8 RC Car USA SHIP!! 3 product ratings3 product ratings - Leopard 4092 4-Pole Brushless Inrunner Motor 1480KV For 1/8 RC Car USA SHIP!! E-flite Park 450 Brushless Outrunner Motor 890Kv EFLM1400 w/ folding propeller. Condition is Used. Slight scuff marks on spinner and propeller otherwise in like brand new condition. Barely used. Am downsizing my house so I need to let go of stuff. This is a good combination for an electric glider, but if you only want the motor you can just remove the propeller with a small allen wrench. For RC model airplane use. 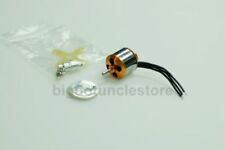 1/8 RC BRUSHLESS MOTOR ENDBELL SELF-ADHESIVE HEAT SINK V2 HEATSINK - 4 PIECES (#322845335927). 1/8 R/C BRUSHLESS MOTOR ENDBELL FLARED HEAT SINK KIT. 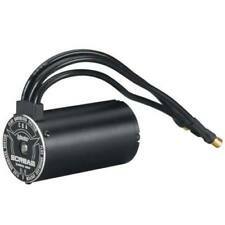 FITS MOST ALL BRUSHLESS R/C MOTORS. THIS 4 PIECE KIT WILL DRAW HEAT AWAY FROM YOUR MOTOR'S CRITICAL ELECTRONICS. Slotted 14-pole outrunner design. High-torque, direct-drive alternative to inrunner brushless motors. 60A brushless ESC. It's an especially good match for the Gee Bee Tiger Moth, TopFlite DC-3, Phoenix Sonic 25 and 3D airplanes such as the E3D. 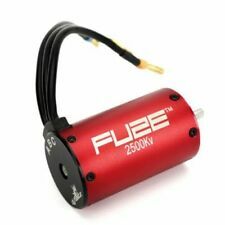 Racing Brushless 2200KV 5mm Shaft Motor Waterproof Motor Savage Flux Motor for HSP Redcat Racing Traxxas 1/8 RC CAR/BOAT. The Flux Tork 2200 features the coolest motor cases we've ever seen, with massive machined cooling fins that really make it look the part of an all-out power plant! Eflite BL50 Brushless Outrunner 525kv rc Airplane EFLM7450 good used free ship. Condition is Used. Shipped with USPS First Class Package. SKYRC ARES PRO COMPETITION BRUSHLESS MOTOR 5.5 Turn - 6450KV with dual sensor ports and sensor wire. This set is direct fit to Latrax Rally, Teton, desert and Hpi mini recon. The set includes a 4800KV brushless motor and a 25A brushles ESC. This motor is built from the best materials available, and is designed to provide both quality and performance at an affordable price. This is the Jurassic Power 2650kV 1/8 Brushless Motor. Bearings Oversize ABEC-1 Front/Rear. NOTE: It is OK to shorten the motor wires. Motor Length 68mm. X8 Pro V2 motor is the updated version of X8 Pro, adds “adjustable timing” function. This series sensored brushless motor is designed for 1/8 scale competition buggy, equipped with 5mm shaft, 12-slot stator and 4-pole motor. Using lighter material but without losing strength. Speed Passion is proud to present the all new MMM V3 Competition. The New Speed Passion Competition V3.0 MMM motor series has the following features. Revolving Speed: 30RPM. Brushbots, BOT DURBYS, Robot Beam Projects, and much much more. Motor x 1pcs. Size: 35mm 12mm 10mm; Shaft length: 10 mm (as the picture shown). Slotted 14-pole outrunner design. High-torque, direct-drive alternative to inrunner brushless motors. 40 - 45A brushless ESC. Equivalent to a 25-size glow engine for sport and scale airplanes weighing 3 - 5.5 lb (1.4 - 2.5 kg). Also fits Typhon, Talion, Kraton, Outcast, Senton, Notorious, and Nero models. Arrma Kraton 6s BLX 15 tooth 5mm bore Mod 1 high quality steel pinion gear with grub screw. This was removed from a new Arrma Kraton 6s blx monster truck. New low IR connectors:instead cables,we use plug directly on motor. to ensure the best possible connection between motor and ESC. You will find a perfect match to your device. - New design of winding:new special winding makes a lower idle current. Slotted 14-pole outrunner design. High-torque, direct drive alternative to inrunner brushless motors. 80-Amp brushless ESC. Equivalent to a 46- to 55-size glow engine for 5.00- to 7.50 lb airplanes. External rotor design 6mm shaft can easily be reversed for alternative motor installations.